Influenced by the creative and adventurous bohemian at heart, Vintage America™ is a modern denim brand that portrays a feminine, sophisticated, and romantic attitude coveted by women of all ages. Inspired by a mix of eclectic prints and comfortable silhouettes, Vintage America™ features unique styles made from high-quality fabrics at attainable prices. Beautiful, light weight, but fitted at the waist which make it impossible for my beachball body-shape to wear. Great lightweight pretty fabric blouse. Not too sheer but airy. Unfortunately I should have waited to order as the day I got my blouse the price dropped ? Absolutely love these jeans. Bought in both light and dark blue. I’m 5-5, 138 and size 6 are perfect. Love the waist band fit and jean fabric. More colors please! Finally found them! 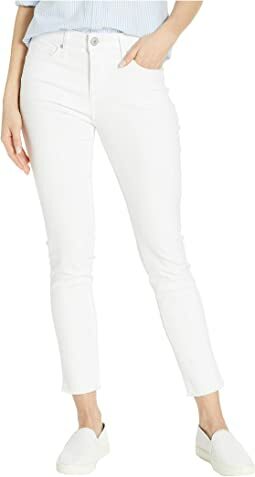 Absolutely love the feel of the fabric and looks of these straight leg jeans. I’m 5-5, 138, and the size 6 are perfect. I bought in both the light and dark blue and wear them constantly. They come out of the wash ready to wear. Love them — more colors please!